Improve the health of your technology projects. Project planning, design, and documentation to help healthcare organizations achieve their goals. ​in hospitals and healthcare facilities throughout Western and Central New York State. Select upstate NY healthcare institutions that rely on Archi-Technology to save time, optimize budgets and avoid pitfalls. Technology Design services for technology infrastructure and IP-connected systems such as Communications, AV, Instructional, Security, and Clinical using a Design-to-Manage approach. Systems Design and Installation Standards provide an organizational strategic framework for technology system design and installation that save time and ensure quality. Technology Procurement services provide turnkey bid management including defining user needs, vendor selection and presentations, and recommendation reports. Systems Documentation services provide an accurate visual database of your current technology systems using an Electronic Facility Records (EFR) approach. Archi-Technology provides direct, onsite services to owners, architects and Construction Management firms that are located in central and western New York State. Select the map to see a detailed view of the NYS counties served. ​Healthcare organizations and their architects in eastern NYS can use our network of credentialed professionals who are certified by Archi-Technology to provide our proven technology services. New and noteworthy for healthcare professionals. ​Technology consulting for the life of your patients. 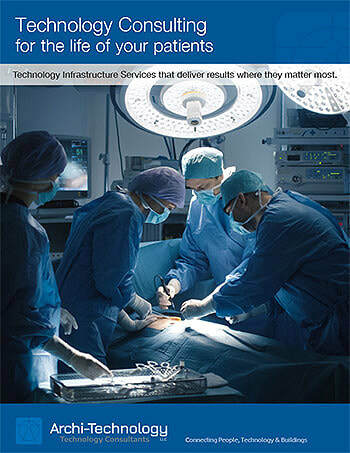 Get Technology Infrastructure services that deliver results where they matter most to your healthcare facility including planning, programming, design and construction management services. View PDF. Free resources for your current or next healthcare technology project.